Describe how cementitious wood fiber (CWF) material improves the acoustical performance of a space. Compare and contrast the performance of CWF acoustical panels with the performance of fiberglass and metal panels. Explain how insulated acoustical roof decks improve the thermal efficiency of a project. Identify the green building credits that CWF products can contribute toward earning in the LEED-NC and LEED-Schools rating systems. The acoustical design of a space dramatically impacts the audience experience at any performance, presentation, or athletic event. Great acoustics set the stage to give audience members and performers goose bumps, literally, and help to ensure that a space can function as it is intended. In large classrooms, good acoustics make it possible to hear the lecture from any seat, while mitigating chatter from the back rows. Audiences can experience the power of the voices in a church choir, without echo, or the crispness of an instrumental solo, without distortion. With good acoustics, a space can even accommodate very different uses, very well. Imagine a cafetorium (a space in an elementary school that splits time as a cafeteria and auditorium) that is able to both manage the lunchtime roar and project those tiny voices out into the Holiday Concert crowd. The acoustical design of a project, whether planned or haphazard, rarely has a neutral or negligible impact on the functionality of the space. While great acoustical design can create exceptional aural experiences or more flexible multi-use spaces, poor acoustical design can be quite detrimental. Poorly planned sound management can be distracting and even uncomfortable for audiences. 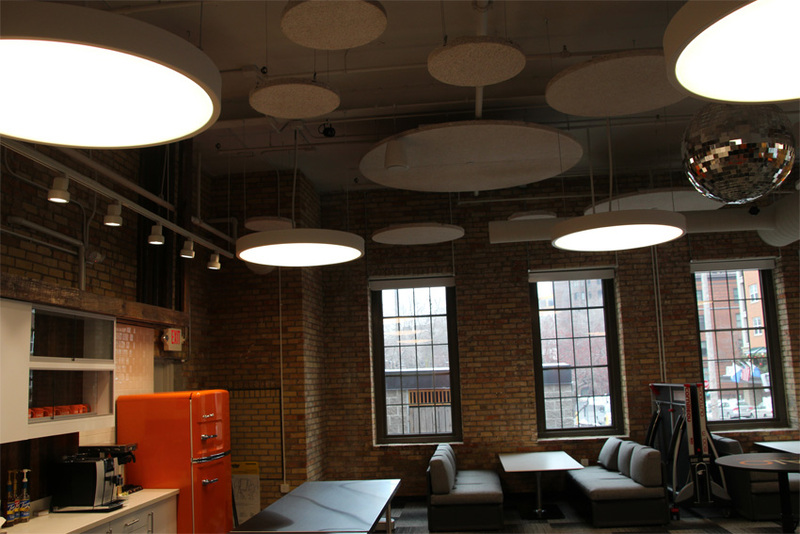 CWF clouds panels are a popular application when repurposing existing building stock, as shown here at the Salo Breakroom in Minneapolis. It may be prudent to first discuss a few properties of sound itself. Sound is defined as a vibration of a medium (like a guitar string or a vocal cord) which creates a wave that travels through gas, liquid, and elastic solid. The number ofwaves that occur per second is referred to as the frequency. Frequency is measured in terms of hertz (Hz). One Hz is equal to one wave cycle per second. The volume of the sound, which we would describe as loud or soft, is measured in decibels (dB), a logarithmic way of describing the ratio of sound pressure. Every increase of 10dB is equivalent to a 10-fold increase in sound intensity (which is roughly equivalent to doubling the loudness). 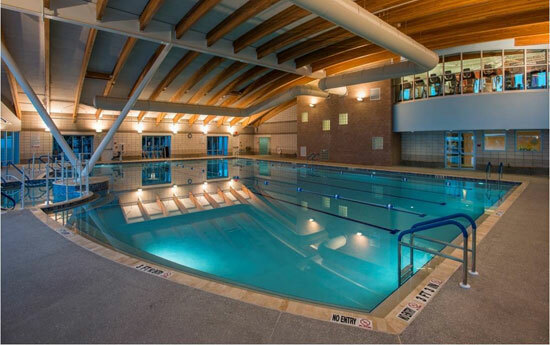 At Sun-N-Fun Lifestyle Wellness Center in Sarasota, Florida, a cementitious wood fiber deck includes acoustic dampening and effective insulation in an easy-to-install composite panel. In discussing the strategies and tools for optimizing the acoustical experience and minimizing distracting and uncomfortable sounds in a space, this article will be concerned with the sound frequencies that are within range of being heard by the human ear and are sufficiently loud enough to be heard. The audio range of hearing for a healthy, young person is 20 to 20,000 Hz. As a reference for applicable decibel levels, a human whisper is approximately 20dB, normal speech falls around 60 dB, and painful damage to the ear can occur at 140 dB. Sound moves through a building in a variety of ways. It can be reflected, bouncing around in a particular area. It can transmit through walls, floors or ceilings. It can bend and flow around an object or squeeze through a small space. Most commonly, sound is transmitted through air. An intentional plan for the acoustic performance of any space is an important element of good architectural practice. When sound waves collide or overlap in a common space, the interference can cause distortion. Too much distortion can lead to the common complaints of being unable to "talk" to companions at dinner or understand the announcer at the game. Turning up the volume on the sound system only exacerbates the problem. To protect against distortion as the sound moves from the source out across the audience, it is important to keep objects and obstructions out of the sound path and ensure that the sound system has good pattern coverage over the space. This will prevent feedback and many other sound distortions. At some point, a sound wave in a building will collide with a wall, ceiling, floor or other object. When a sound wave hits a material, three things can happen: the sound can be reflected, transmitted, or absorbed. When it comes to sound management, the magic is in the material. Consider sound reflection. Hard, smooth walls simply bounce the sound back into the central space, almost assuring that sound waves will interfere with one another and muddy sound clarity. The term sound reverberation refers to instances when the reflected sound is perceptible even after the source of the sound has ceased. Careful planning for the acoustics of a space include a balance of reflective surfaces and sound-absorbing surfaces. Sound transmits through elastic material, although sound travels differently through different materials. For example, sound waves travel at a rate of 1,128 feet per second through air (at 70 degrees F), 11,700 feet per second through wood, and 18,000 feet per second through steel. Sound can travel through thin walls, water and more. To try to control the transmission of sound through a space, architects can specify inelastic materials, such as lead, which is, incidentally, considered a hazardous material, or they can increase the mass of the object through which sound is transmitting. A wall of solid concrete three feet thick will reduce the volume of a sound by 60dB, because it forces the sound waves to work harder and expend more energy to pass through the thick concrete wall. Unfortunately, budgets, space limitations, and design practicality may prohibit concrete encased classrooms or gymnasiums. 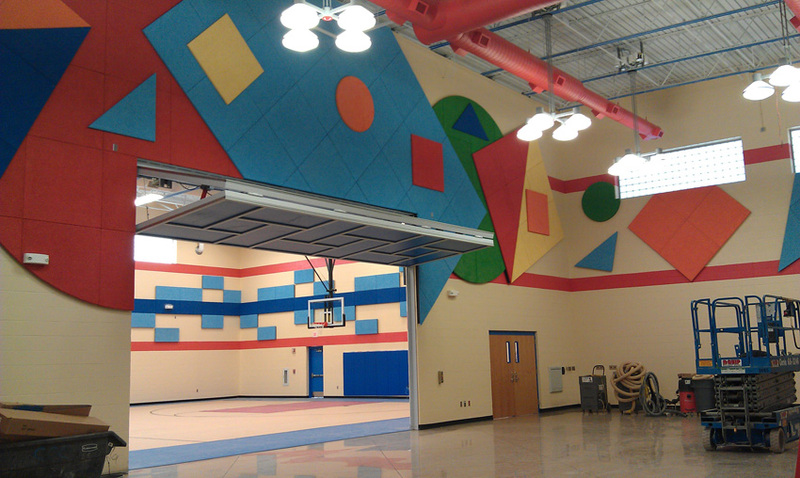 Lincoln Elementary School in Augusta, Kansas, uses porous materials on the walls to effectively absorb sound. Another way to control airborne sound in a space is to use porous materials that absorb sound on the walls and ceiling of a building. The sound waves get trapped within the fibers of the material, where the sound energy is converted into small amounts of heat. Today, there are many acoustical absorption solutions that are practical, effective, and aesthetically pleasing. When selecting the right acoustical treatment for a space, the material matters. Different materials absorb different sound frequencies, so it is important to ensure that the specified acoustical product absorbs the actual sound frequencies that will be present in the space. Materials also vary in the physical amount of sound energy that they can absorb, overall durability, fire resistance, environmental footprint and aesthetic appeal.